I love that watercolour is making a comeback, it’s just so versatile. Classic or modern, nursery or bedroom, boy or girl, it all works. And when paired with superheroes, these unlikely partners in crime manage to strike the perfect style note. These gorgeous prints are the creation of Bianca from Little Pop Studio who specialises in personalised watercolour pop art. 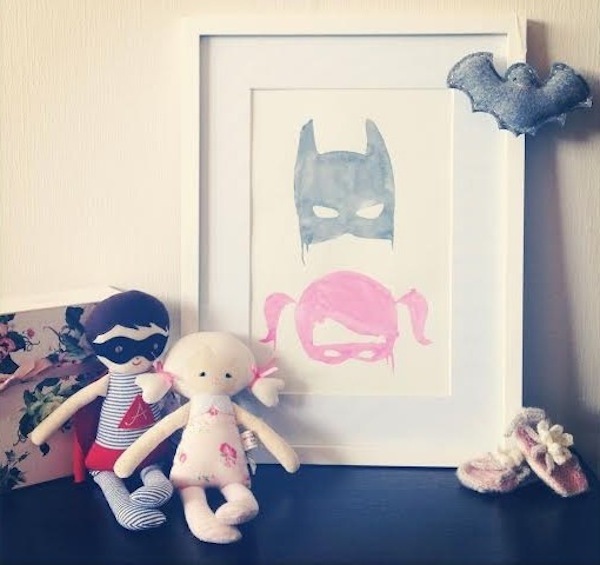 Her Batboys and Batkids prints are part of a limited edition print run that are selling off the virtual shelves right now. Interested? Head over to Little Co a new online concept store out of New Zealand that stocks local and international handmade products (including many of Babyology’s favourite Aussie brands) for growing little families. Both prints cost $40 unframed and shipping is a very impressive $6 flat rate.